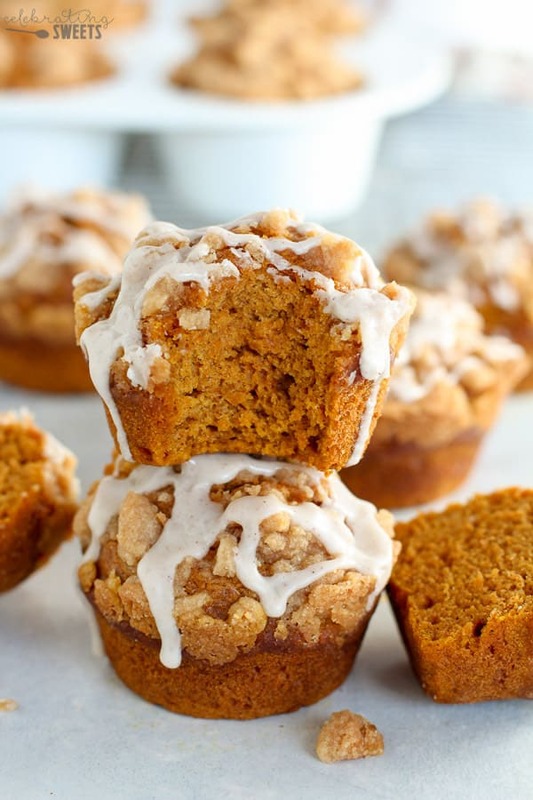 Moist and tender spiced Pumpkin Muffins topped with a brown sugar crumble and a drizzle of cinnamon icing. The calendar says it’s not fall for a couple more weeks. Arizona weather says it’s not fall for a couple more months. But guess who doesn’t care? Me! 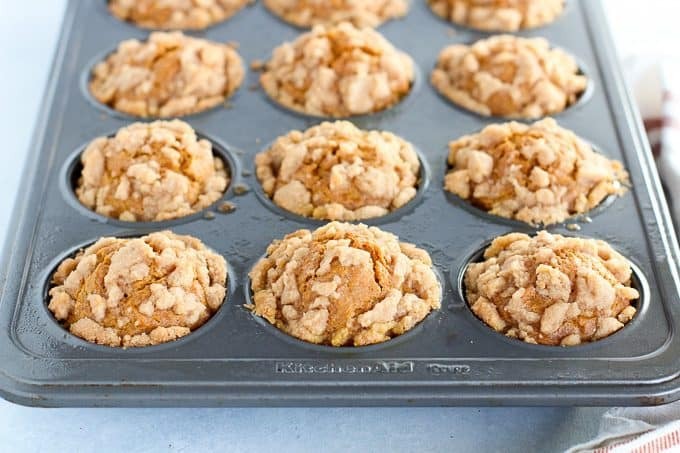 I’m bringing you Pumpkin Muffins – loaded with pumpkin spice, topped with a buttery crumble, and drizzled in cinnamon icing – because, it’s FALL! Ok, not technically, but just play along. 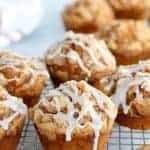 Muffins: These muffins start with all the usual ingredients. Flour, spices, brown sugar, oil, eggs, and pumpkin. You can swap in some whole wheat flour if you’d like to make them more nutritious. I keep the muffins mildly sweet, since we’re adding a crumb topping and icing. Crumb topping: Sugar, cinnamon, salt, butter, and flour. 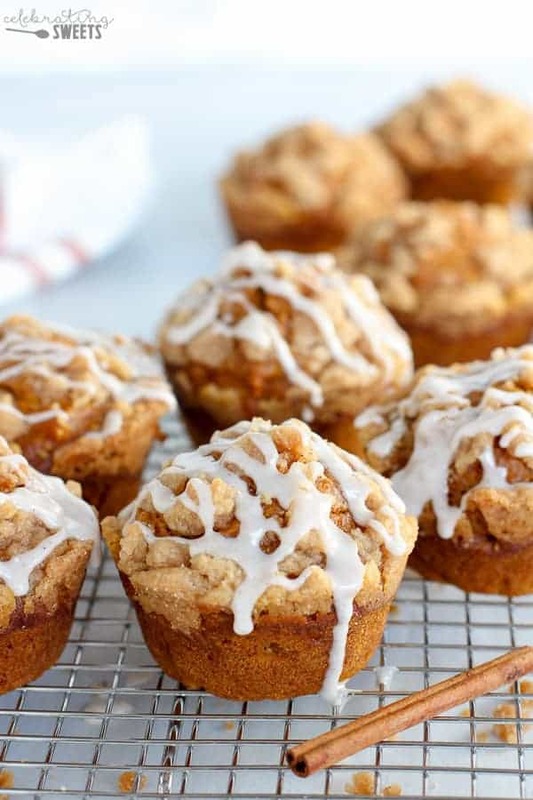 Sweet, buttery, crumbly goodness topping every bite of these muffins! These Pumpkin Muffins are soft, sweet, and wonderful. If a muffin could ever be described as “cozy,” this is it. I like to think of these as a cross between a coffee cake and a muffin. 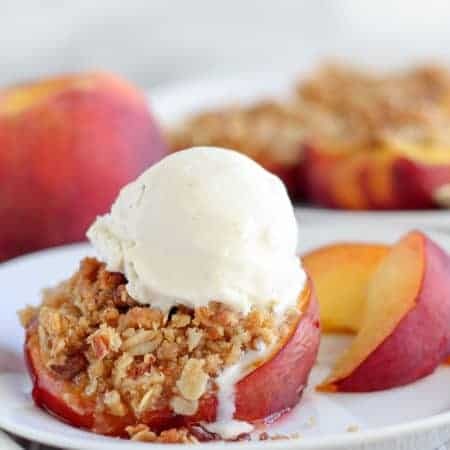 They straddle the line between breakfast and dessert, and they can absolutely pass as both. And now the fall floodgates have opened. I have tons of fantastic pumpkin and apple recipes coming in the weeks ahead. Cliche? Absolutely. Basic? You know it. I’m fall-obsessed and proud of it! In a medium bowl, combine sugars, cinnamon, salt, and melted butter. Whisk until combined. Add flour, and stir until the flour is combined. Set aside. Preheat oven to 350°F. Grease a 12 cup muffin tin, or line with paper liners. 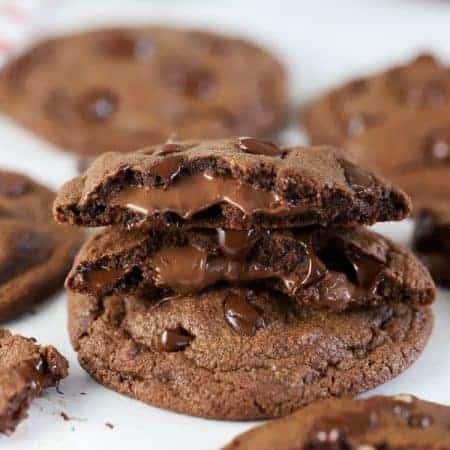 In a medium bowl, combine flour, cinnamon/spice, baking soda, baking powder, and salt. In a large bowl, whisk eggs, brown sugar, oil, pumpkin puree and vanilla, until combined. Add flour mixture, and stir until combined (I use a rubber spatula), being careful not to over-mix. Divide the batter between 12 muffin cups. 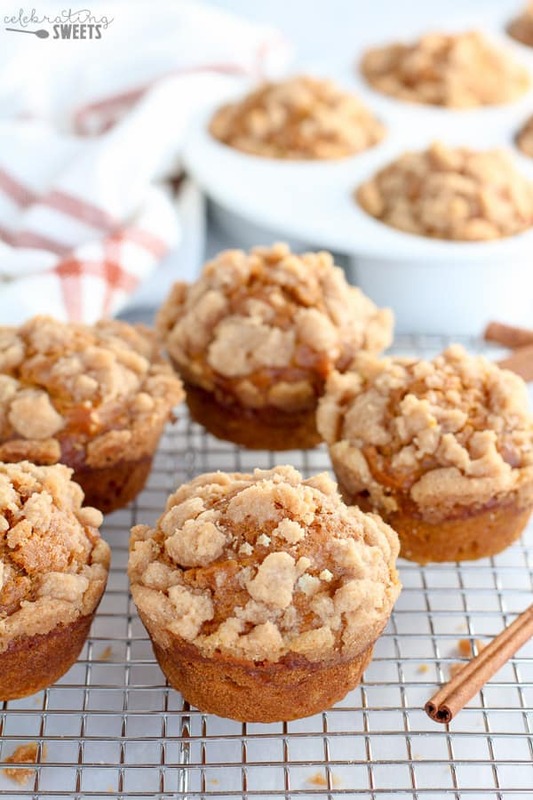 Pinch off small pieces of the crumb topping and scatter them over the tops of each muffin. Bake for approximately 20 minutes, until a toothpick inserted into the center of the muffins comes out clean. Cool completely on a wire rack. Whisk all ingredients until smooth. 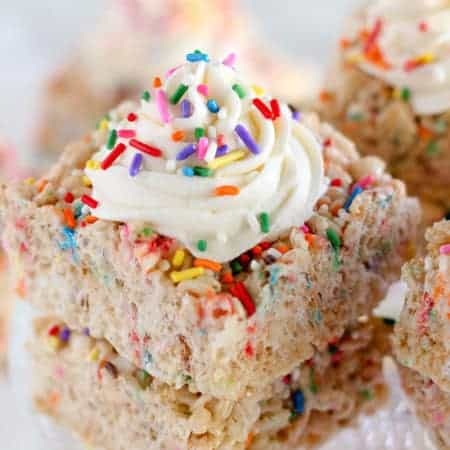 Use a small spoon to drizzle icing over the tops of the cooled muffins. Feel free to swap up to half of the all purpose flour for white whole wheat flour. Turned out great!! Very moist, not too sweet. Did have to add more milk to the icing. Glad you enjoyed them. Thanks for taking the time to comment. Delicious. Icing was runny. Will add more powered sugar next time. Also had to bake 5 min longer. Next time set temp on 425. Like all other muffins I make. I’m glad you liked them. Thanks for stopping by! 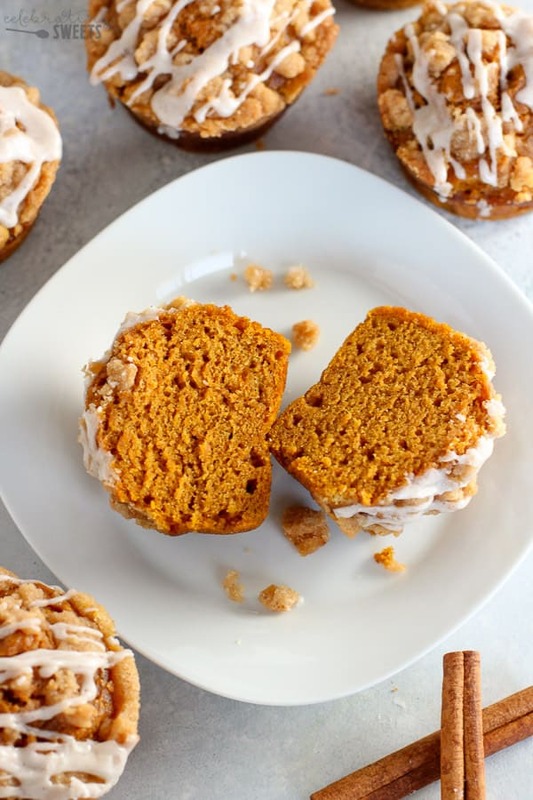 These are perfect not over powering spice so you can actually taste pumpkin, did not have the stuff on hand to make the glaze so I skipped it if you prefer something less sweet then skipping it would be perfect. A very balanced recipe, wouldnt change anything. Would I be able to replace brown sugar for maple syrup? And how would the measurements work? Since the maple syrup is a wet ingredient and the brown sugar is dry, it would be risky to make the swap. The muffins might be too wet. If you’re looking to remove refined sugar you can try swapping the brown sugar for an equal amount of coconut sugar.